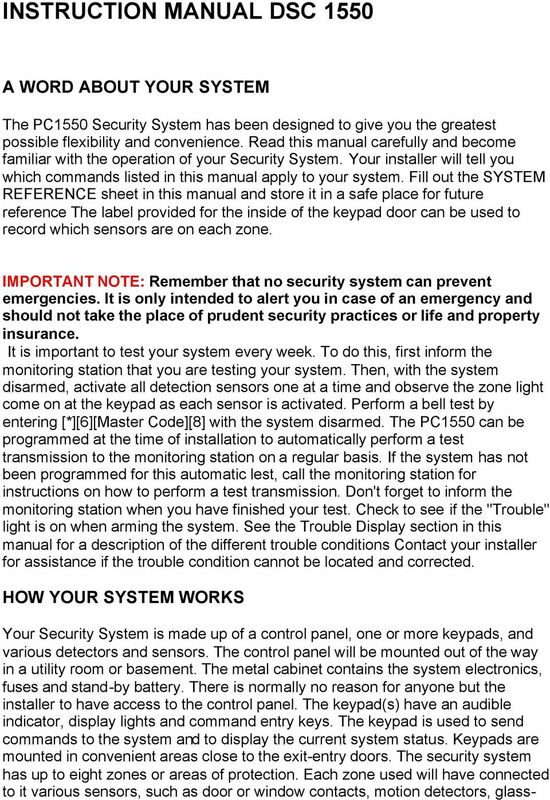 Download "INSTRUCTION MANUAL DSC 1550"
2 break detectors and vibration or shock sensors. When a sensor is in alarm, a keypad light will be on to indicate which zone is in alarm. MASTER CODE The 4 digit Master Code is used for arming and disarming the system, for programming additional access codes. and for changing other features. The Master Code will be supplied to you by your installer. All keypad entries are made by pressing one key at a time and may be changed by you at any time if the installer selects an option. For additional access codes, see Programming Additional Access Codes. ARMING Close all protected doors and windows and stop movement in areas covered by motion detectors. If the "Bypass" light is ON, be sure zones are being intentionally bypassed before arming the system (see Zone Bypassing). Check to see that the "Ready" light is ON (all zones are closed). The system cannot be armed unless the "Ready" light is ON. Enter a [4 digit access code]. As each digit is entered, the keypad sounder will beep. Once the correct access code is entered, the "Armed" light will come ON and the keypad sounder will beep quickly. If the access code was entered incorrectly or the "Ready" light was not ON, the keypad sounder will beep steadily for 2 seconds. When the correct code is entered and the system is armed, exit through the door indicated by your installer as the exit-entry door. The exit time may be changed by your installer (please refer to the Quick-Arm feature). Arming and Commercial Installations When an Access Code is entered to arm the system, the bell or siren will sound a short tone to indicate that the system is being armed. If your security system is programmed to report to a monitoring station, the keypad will also sound a tone to indicate that the monitoring station has been advised of the arming of the system. If the system is being armed and the bell or siren fails to sound, or if the keypad does not sound a tone to acknowledge that the monitoring station has been advised of the arming, arrange for service for the system. 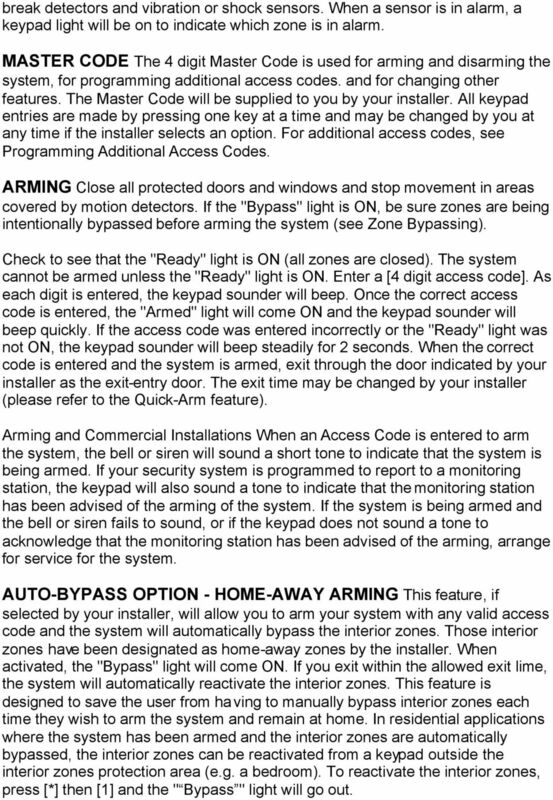 AUTO-BYPASS OPTION - HOME-AWAY ARMING This feature, if selected by your installer, will allow you to arm your system with any valid access code and the system will automatically bypass the interior zones. Those interior zones have been designated as home-away zones by the installer. When activated, the "Bypass" light will come ON. If you exit within the allowed exit lime, the system will automatically reactivate the interior zones. This feature is designed to save the user from having to manually bypass interior zones each time they wish to arm the system and remain at home. In residential applications where the system has been armed and the interior zones are automatically bypassed, the interior zones can be reactivated from a keypad outside the interior zones protection area (e.g. a bedroom). To reactivate the interior zones, press [*] then  and the " Bypass " light will go out. 3 ENTRY DELAY OFF ARMING If you wish to arm your system and eliminate the entry delay, enter [*] before your access code. The "Armed" light will flash as a reminder that the system is armed and has no entry delay. An entry through any zone programmed as a delay zone will create an instant alarm. e.g. To arm without entry delay...press [[*][Access Code] DISARMING Enter the premises only through the door indicated by your installer as the entry/exit door. The keypad sounder will be ON. Go to the keypad and enter the [4 digit access code]. If an error is made entering the code, press the [#] key and enter the code again. The Armed" light will go out and the keypad sounder will stop. A correct access code must be entered before the allowed entry time expires. The entry delay time may be changed by the installer. If an alarm occurred while the panel was armed, the "Memory" light and the light for the zone which caused the alarm will start to flash and will continue flashing for 2 minutes. At the end of 2 minutes, the keypad lights will stop flashing and the keypad will return to the normal Ready condition. If you return home and find an alarm has occurred while you were away, it is possible that an intruder may still be on the premises. Go to a neighbor s and if your system is monitored, call the monitoring station. They will advise what action has been taken as a result of the alarm and whether the premises are safe to enter. If your system is not monitored, call the local police to investigate. ALARM MEMORY DISPLAY If the "Memory" light is on, an alarm has occurred since the last time the panel was armed. 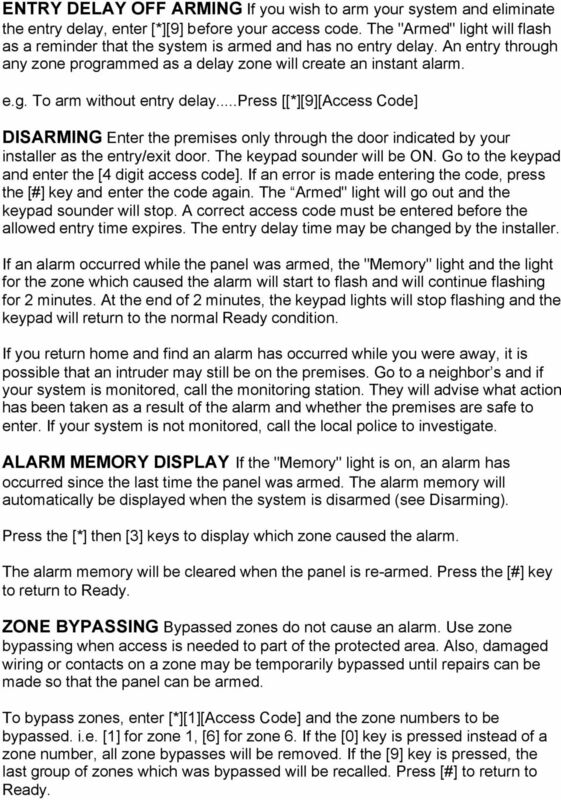 The alarm memory will automatically be displayed when the system is disarmed (see Disarming). Press the [*] then  keys to display which zone caused the alarm. The alarm memory will be cleared when the panel is re-armed. Press the [#] key to return to Ready. ZONE BYPASSING Bypassed zones do not cause an alarm. Use zone bypassing when access is needed to part of the protected area. Also, damaged wiring or contacts on a zone may be temporarily bypassed until repairs can be made so that the panel can be armed. To bypass zones, enter [*][Access Code] and the zone numbers to be bypassed. i.e. for zone 1,  for zone 6. If the  key is pressed instead of a zone number, all zone bypasses will be removed. If the  key is pressed, the last group of zones which was bypassed will be recalled. Press [#] to return to Ready. 4 For security reasons, your installer may prevent the bypass command from operating on certain zones. The "Bypass" light is ON as long as at least ONE zone is bypassed. Do not unintentionally bypass zones when arming. Zone bypasses are automatically canceled each time the panel is disarmed and must be re-applied before the next arming. 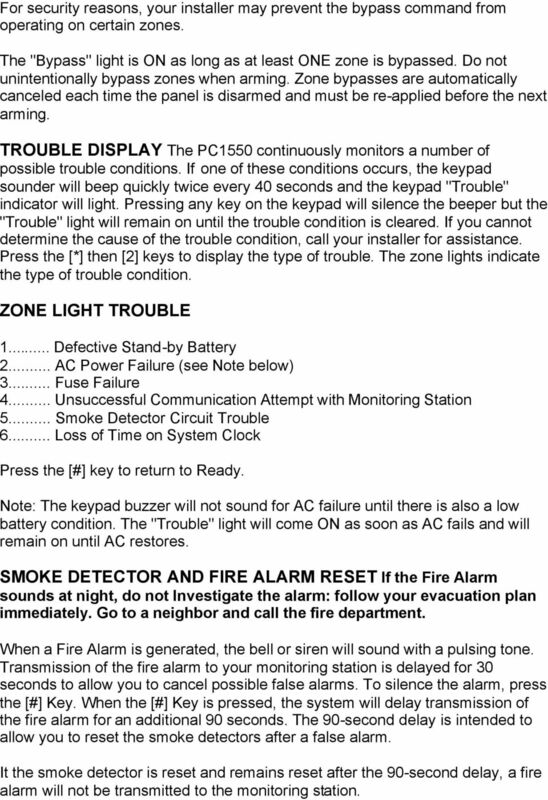 TROUBLE DISPLAY The PC1550 continuously monitors a number of possible trouble conditions. If one of these conditions occurs, the keypad sounder will beep quickly twice every 40 seconds and the keypad "Trouble" indicator will light. Pressing any key on the keypad will silence the beeper but the "Trouble" light will remain on until the trouble condition is cleared. If you cannot determine the cause of the trouble condition, call your installer for assistance. Press the [*] then  keys to display the type of trouble. The zone lights indicate the type of trouble condition. ZONE LIGHT TROUBLE 1... Defective Stand-by Battery 2... AC Power Failure (see Note below) 3... Fuse Failure 4... Unsuccessful Communication Attempt with Monitoring Station 5... Smoke Detector Circuit Trouble 6... Loss of Time on System Clock Press the [#] key to return to Ready. Note: The keypad buzzer will not sound for AC failure until there is also a low battery condition. The "Trouble" light will come ON as soon as AC fails and will remain on until AC restores. SMOKE DETECTOR AND FIRE ALARM RESET If the Fire Alarm sounds at night, do not Investigate the alarm: follow your evacuation plan immediately. Go to a neighbor and call the fire department. When a Fire Alarm is generated, the bell or siren will sound with a pulsing tone. Transmission of the fire alarm to your monitoring station is delayed for 30 seconds to allow you to cancel possible false alarms. To silence the alarm, press the [#] Key. When the [#] Key is pressed, the system will delay transmission of the fire alarm for an additional 90 seconds. The 90-second delay is intended to allow you to reset the smoke detectors after a false alarm. It the smoke detector is reset and remains reset after the 90-second delay, a fire alarm will not be transmitted to the monitoring station. 6 5... 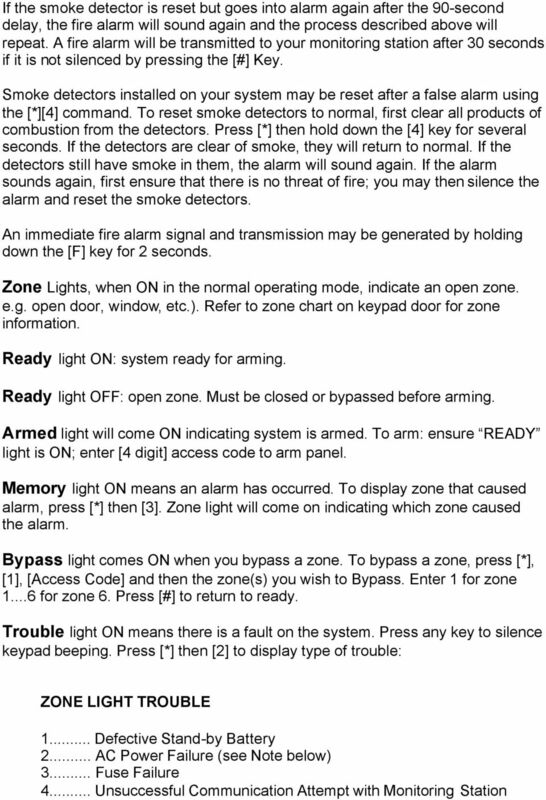 Smoke Detector Circuit Trouble 6... Loss of Time on System Clock Program Security Codes: Press [*], then enter [Master Code] to enter in programing mode for codes. As soon as this command is entered, the "Memory", "Bypass" and "Trouble" light will begin to flash. The zone lights are used to indicate the program status of the 6 security codes (light offcode is not programmed ; light on - code is programmed ; light flashing - this code is being programmed). Zone 1=Master code. Select a code by pressing a key from 1 to 6 (the coresponding zone-light will start to flash). Enter the [4 digit] New-code. Press [#] to return to ready mode. Press [#]... when an error is made in entering code, then enter code again. to return to ready state after using [*] commands. QUICK-ARM FEATURE When the Quick-Arm feature is enabled, the panel may be armed simply by entering [*] instead of a 4 digit code. The [*] command will not disarm the panel. Enter [*][Master Code] to turn ON and OFF the Ouick-Arm feature. When the command is entered, the keypad will beep 3 times if the feature is being enabled and will sound one long beep if the feature is being disabled Press [#] to return to Ready. QUICK EXIT OPTION This feature, if selected by your installer, allows one exit with the system armed without affecting its current armed status. Pressing [*] gives you 2 minutes to exit if you have already armed the system. This is useful if you want to exit while preserving the protection for someone left on the premises. Once you have exited, the system will be armed as before. If the zone is open after 2 minutes or there has been more than one exit, the prealert will sound. DOOR CHlME FEATURE The door chime feature is used, while the panel is disarmed, to provide a tone from the keypad each time a door or window is opened or closed. The doors and windows which will provide this indication are programmed by your installer. 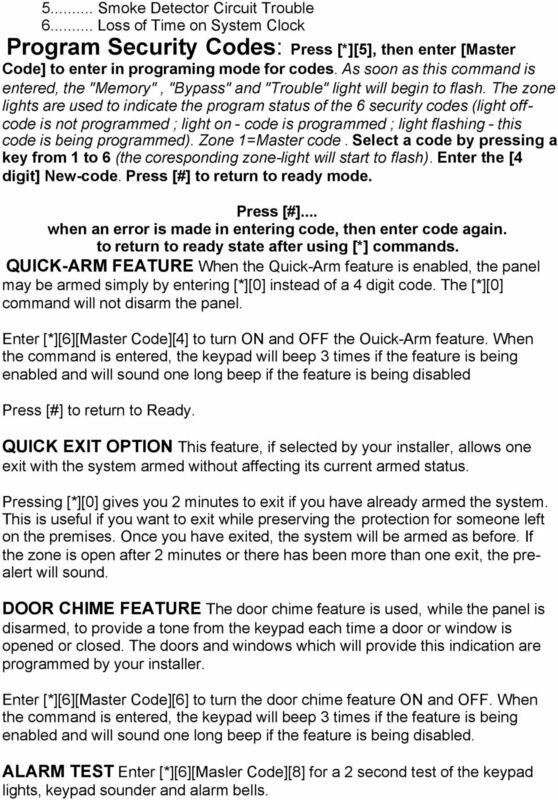 Enter [*][Master Code] to turn the door chime feature ON and OFF. When the command is entered, the keypad will beep 3 times if the feature is being enabled and will sound one long beep if the feature is being disabled. 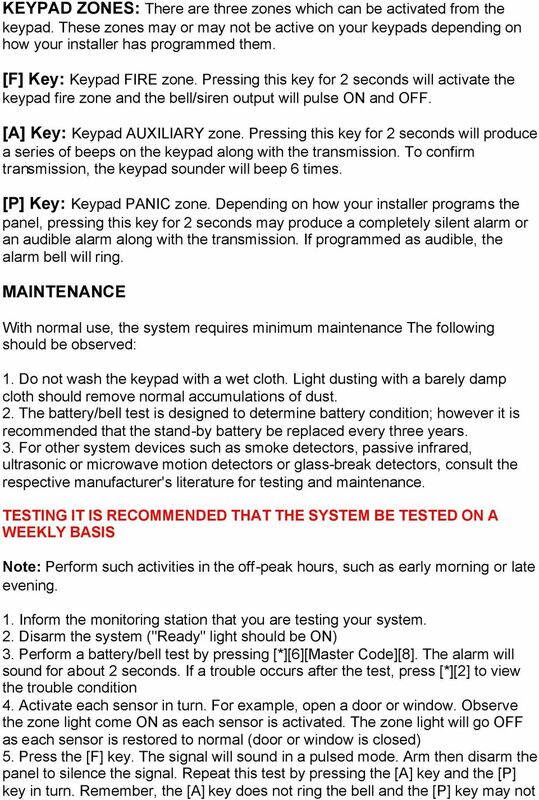 ALARM TEST Enter [*][Masler Code] for a 2 second test of the keypad lights, keypad sounder and alarm bells. 8 be programmed for an audible signal. 6. If the fire zone is used, activation will cause the signal to sound in a pulsed mode. CAUTION: Do not use open flame or burning materials to lest a smoke detector. Contact your installer for information on safe methods to activate a smoke detector. 7. Should your system fail to operate properly, call your installer for service. 8. When testing is complete, call and advise the monitoring station. FIRE SAFETY IN THE HOME Most fires occur in the home and to minimize this danger it is recommended that a household fire safety audit be conducted and a family escape plan be developed. HOUSEHOLD FIRE SAFETY AUDIT 1. Are all electrical appliances and outlets in a safe condition?. Check for frayed cords, over-loaded lighting circuits, etc. If you are uncertain about the condition of your electrical appliances or household service, have a professional evaluation. 2. Are all flammable liquids stored safely in closed containers in a well ventilated cool area? Cleaning with flammable liquids should be avoided. 3. Are fire hazardous materials (matches) well out of reach of children? 4. Are furnaces and wood burning appliances properly installed, clean and in good working order? Have a professional evaluation. FAMILY ESCAPE PLANNING There is often very little time between the detection of a fire and the lime it becomes deadly. It is thus very important that a family escape plan be developed and rehearsed. 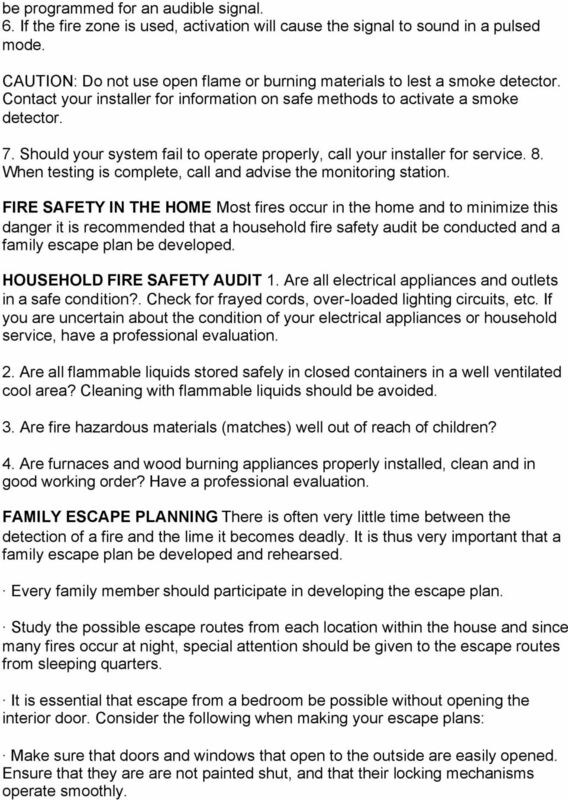 Every family member should participate in developing the escape plan. Study the possible escape routes from each location within the house and since many fires occur at night, special attention should be given to the escape routes from sleeping quarters. It is essential that escape from a bedroom be possible without opening the interior door. Consider the following when making your escape plans: Make sure that doors and windows that open to the outside are easily opened. Ensure that they are are not painted shut, and that their locking mechanisms operate smoothly. 9 If opening the exit or using the exit is too difficult for children, the elderly or handicapped. plans for rescue should be developed. This includes making sure that those who are to perform the rescue can promptly hear the fire warning signal. If the exit is above the ground level, an approved fire ladder or rope should be provided as well as training in its use. Exits on the ground level should be kept clear. Be sure to remove snow from exterior patio doors in winter: outdoor furniture or equipment should not block exits. The family should have a predetermined assembly point where everyone can be accounted for; for example, across the street or at a neighbor s house. Once everyone is out of the house, call the Fire Department. A good plan emphasizes quick escape Do not investigate first or attempt to fight the fire, and do not attempt to rescue belongings or pets as this takes up valuable time. Once outside, do not re-enter the house. Wait for the fire department. Write the plan down and rehearse frequently, so that should an emergency arise, everyone will know what they are to do. Revise the plan as conditions change; for example, when there are more or fewer family members in the home, or if there are changes to the house. 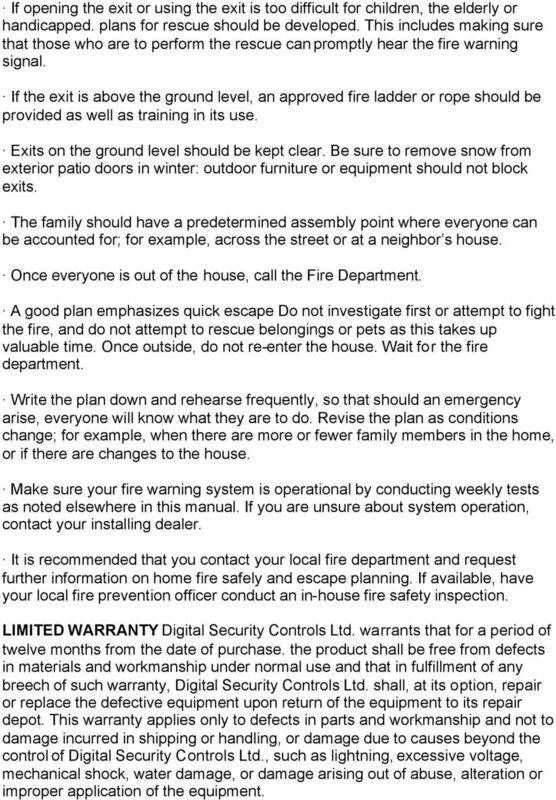 Make sure your fire warning system is operational by conducting weekly tests as noted elsewhere in this manual. If you are unsure about system operation, contact your installing dealer. It is recommended that you contact your local fire department and request further information on home fire safely and escape planning. If available, have your local fire prevention officer conduct an in-house fire safety inspection. LIMITED WARRANTY Digital Security Controls Ltd. warrants that for a period of twelve months from the date of purchase. the product shall be free from defects in materials and workmanship under normal use and that in fulfillment of any breech of such warranty, Digital Security Controls Ltd. shall, at its option, repair or replace the defective equipment upon return of the equipment to its repair depot. 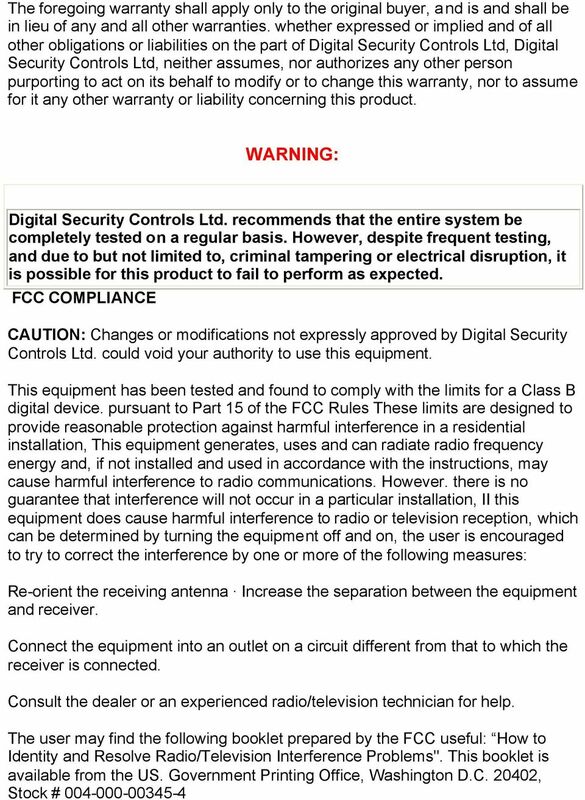 This warranty applies only to defects in parts and workmanship and not to damage incurred in shipping or handling, or damage due to causes beyond the control of Digital Security Controls Ltd., such as lightning, excessive voltage, mechanical shock, water damage, or damage arising out of abuse, alteration or improper application of the equipment. 12 The telephone company may make changes in its communications facilities, equipment, operations or procedures, where such actions are reasonably required and proper in its business. Should any such changes render the customer's terminal equipment incompatible with the telephone company facilities the customer shall be given adequate notice to the effect modifications to maintain uninterrupted service. 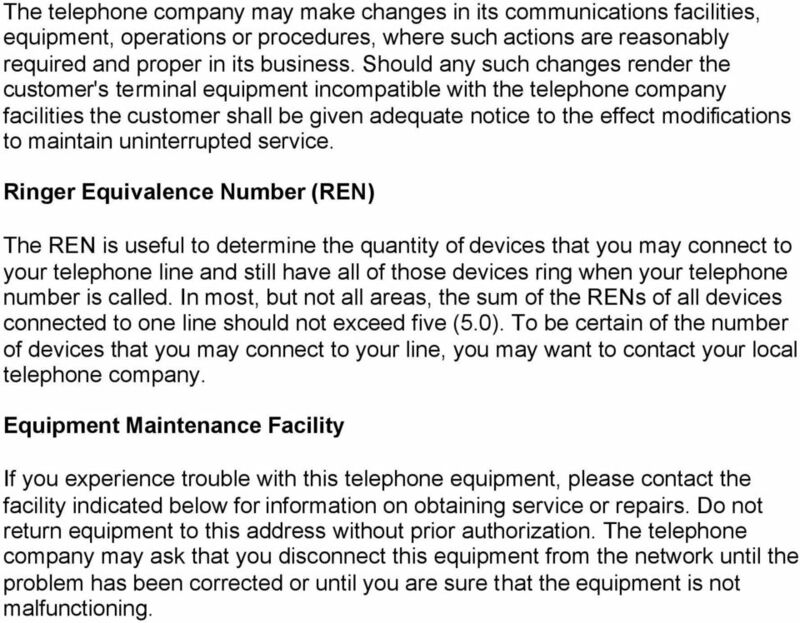 Ringer Equivalence Number (REN) The REN is useful to determine the quantity of devices that you may connect to your telephone line and still have all of those devices ring when your telephone number is called. In most, but not all areas, the sum of the RENs of all devices connected to one line should not exceed five (5.0). To be certain of the number of devices that you may connect to your line, you may want to contact your local telephone company. Equipment Maintenance Facility If you experience trouble with this telephone equipment, please contact the facility indicated below for information on obtaining service or repairs. Do not return equipment to this address without prior authorization. 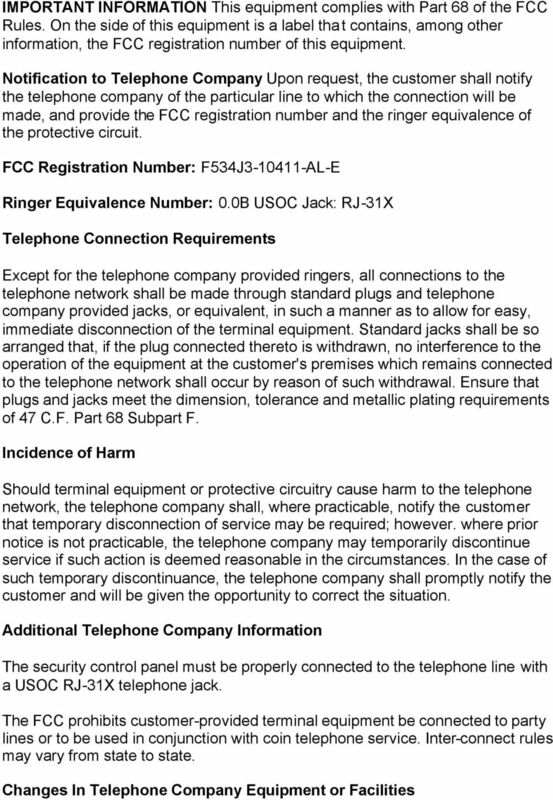 The telephone company may ask that you disconnect this equipment from the network until the problem has been corrected or until you are sure that the equipment is not malfunctioning. INSTRUCTION MANUAL SOFTWARE VERSION 1.0R FCC COMPLIANCE STATEMENT CAUTION: Changes or modifications not expressly approved by Digital Security Controls Ltd. could void your authority to use this equipment. Instruction Manual PC15OO/PC155O W A R N I N G This manual contains information on limitations regarding product use and function and information on the limitations as to liability of the manufacturer. Changes or modifications not expressly approved by Interactive Technologies, Inc. can void the user s authority to operate the equipment. Changes or modifications not expressly approved by Interlogix, Inc. can void the user s authority to operate the equipment. Operating Guide Manuel de l utilisateur Model RF-110 Modèle RF-110 English Thank you for purchasing this Ringmaster; please read this operating guide carefully before use and keep it for future reference.